On the return journey, the Expedition separated here into two parties. Travelers' Rest State Park is located just south of Lolo, west of Highway 93, at 6550 Mormon Creek Road. 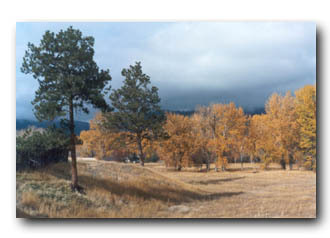 Lolo, Montana, is 12 miles southwest of downtown Missoula at the intersection of US Highways 12 and 93. Traveling south from Lolo on US 93, upstream along the Bitterroot River and through the Bitterroot Valley, leads to Lost Trail Pass (elevation 7,014 ft.) on the Idaho border (83 miles). Traveling west from Lolo on US 12, upstream along Lolo Creek, leads to Lolo Pass (elevation 5,235 ft.), also on the Idaho border (33 miles). The town of Lolo sits beneath and east of beautiful Lolo Peak (elevation 9,075 ft.). The park is open Daily 8 a.m.-8 p.m., Memorial Day weekend through Labor Day weekend, 8 a.m. - 5 p.m. rest of the year. The Traveler's Rest Preservation & Heritage Association reported that archaeologists uncovered what appears to be the latrine used by the Corps of Discovery while camping at Traveler's Rest. Significant amounts of mercury were found in the soil where a Corps' latrine was located. The expedition regularly used mercury as a medical treatment.